BUSAN, May 26 2018 (IPS) - The Global Green Growth Institute (GGGI) presented the African model of a National Financing Vehicle in which the governments of Rwanda and Ethiopia have successfully promoted green growth and climate resilience, at an event May 25 on the sidelines of the annual meetings of the Board of Governors of the African Development Bank (AfDB) in Busan, South Korea. GGGI and AfDB signed a partnership to accelerate Africa’s inclusive and sustainable green growth. 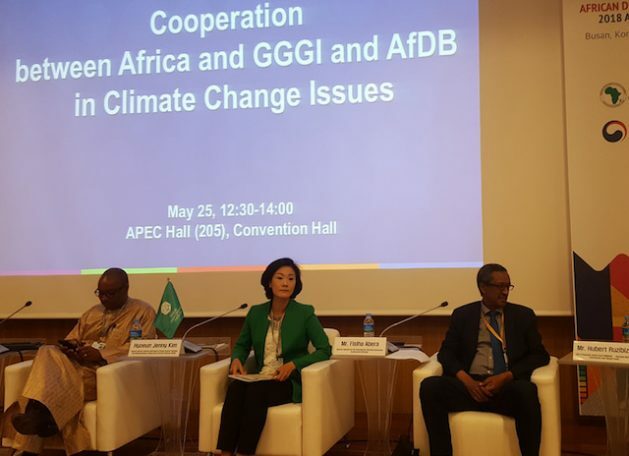 “We will focus on Africa, as we are seeing a huge potential in Africa,” Hyoeun Jenny Kim, deputy director general of GGGI, said in her opening remarks. “So far, we’ve worked very closely and very extensively with Ethiopia and Rwanda throughout the comprehensive stages of designing and developing projects as well as mobilizing funds,” she told IPS after the side event. “We’ve so far worked only with a small number of countries… But these climate funding success stories in Rwanda and Ethiopia encouraged us to extend our reach to other Africa countries like Senegal, Uganda or Mozambique,” she added. Hubert Ruzibiza, CEO of Rwanda’s Green Fund, revealed how Rwanda has successfully financed green growth and climate resilience through its National Fund for Environment and Climate Change (FONERWA), whose function is to identify and invest in the best public and private projects that have the potential for transformative change that aligns with Rwanda’s commitment to building a strong green economy. “FONERWA has a global track record as the national financing mechanism by bringing together public and private sector investment,” Ruzibiza noted. The side event also highlighted the GGGI-Ethiopia partnership to design, develop and implement Ethiopia’s political commitment to CRGE (Climate Resilience Green Economy), as well as its national financing mechanism called the Ethiopia CRGE Facility, which is the country’s primary financial instrument to mobilize, access and combine domestic and international, public and private sources of finance to support the institutional building and implementation of the CRGE Strategy. “As we are raising the green growth and climate resilient funding, especially from small and medium-sized business that constitutes about 90 percent of our business, so are the number of projects increasing,” said Fisiha Abera, Director General of the International Financial Institutions Cooperation in Ethiopia. “The CRGE model shows the importance of the government’s political commitment in which the government takes a holistic national approach. So our advisers are working closely with a wide variety of government functions,” said Kim. The AfDB and GGGI signed an MOU on the sidelines of the African Development Bank Group’s Annual Meetings in Busan to promote programs, conduct joint studies and research activities to accelerate green growth options for African countries, as well as to work together in the GGGI’s cities programs and the AfDB’s initiatives on clean energy, sustainable landscapes, green cities, water and sanitation, with the ultimate goal of strengthening climate resilience in Africa. AFDB is Africa’s premier development finance institution. It comprises three distinct entities: the AfDB, the African Development Fund and Nigeria Trust Fund NTF. Working on the ground in 44 African countries with an external office in Japan, the AfDB contributes to the economic development and the social progress of its 54 regional member states.